This charger dates to the Qing dynasty, Qianlong period, c. 1755, and is part of one of the most important Chinese Export porcelain services made for the Swedish market. It was probably made for the Swedish count Fredrik Gyllenborg. Count Fredrik Gyllenborg was one of the foremost participants in the second octroi (Royal trade monopoly) of the Swedish East India Company (1746-66). 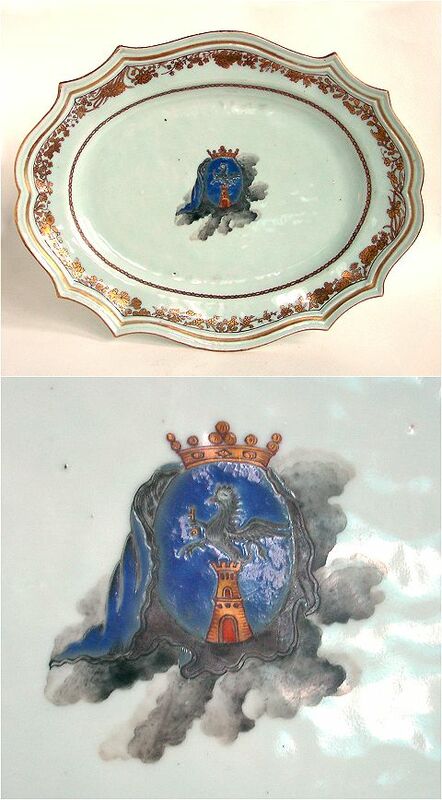 The peculiar clouds that surrounds the coat of arm are assumed to be caused by the drawing having been stained by moisture during the trip to China, and that the Chinese porcelain decorators thus have tried to imitate the ink stain as faithfully as possible. The decoration is in blue, black, iron red and gilt. and carries the coat of arm of the family of Gyllenborg in an oval shield, surrounded by a draped cloth and a cloud. Litterature: Wirgin, Jan, Från Kina till Europa, illustrated and described on p. 137.